Barbara Weir, a member of the stolen generation, was removed from her mother, Minnie Pwerle, and her Eastern desert homeland when just 9 years of age. At 18 years, Barbara was living in Darwin and a chance meeting between her husband and Billy Stockman enabled her to reconnect with her family in Utopia. 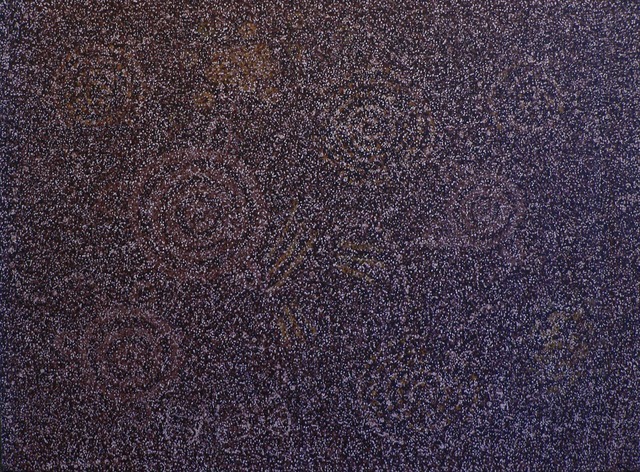 Emily Kngwarreye, who had helped to look after her as a small child, provided the vital link in reconnecting her with her mother after she moved back to Utopia permanently in 1977. Here she discovered her own affinity with the bush berries, grass seeds, wild flowers and the desert country of her birth that was to become the wellspring of her art. Her work straddles the two major identifiable Eastern Desert painting styles; that of the gestural painters exemplified by her auntie Emily Kngwarreye and her mother Minnie Pwerle, and that of the highly intimate and painstaking imagery created by Kathleen Petyarre and Angelina Ngal. Barbara began working in Batik in the late 1980s, and began her painting career with images founded in structure and composition on conventional traditional motifs with subtle tonal shifts and overlays. This intimate detailed painting style developed later in to the most complex of her later works in which depictions of her ‘mother’s country’ are composed of blankets of finely arranged dots, beneath which lie submerged symbols relating to specific sites and sacred ‘women’s law’. The foundation of her second, and most popular motif and style, which is typified by the small 90 x 60 cm. Grass Seed Dreaming illustrated above, lies in her fine linear technique in which she overlaps thick, vigorously applied brilliantly coloured brushstrokes that superbly imitate and evoke the movement of native grass. What began as far more conventional, less highly charged works in the late 1990’s, witnessed a transformation around the turn of the millennium, coinciding with her first solo exhibition Dream Works, a sell out success at both Flinders Lane Gallery in Melbourne and Gallery Savah in Sydney. These exhibitions forecast her use of bright colour applied with a freedom of expression reminiscent of Emily Kngwarreye’s daring unselfconscious works a decade earlier. Since this time Barbara Weir’s paintings have been included in exhibitions in every capital city in Australia as well as important shows in Singapore, Chicago, Santa Fe, Paris, Copenhagen and Auckland as she has built a career that continues to blossom and develop both technically and artistically. While Sotheby’s are yet to offer even one single work by Barbara Weir, Lawson~Menzies have offered fourteen, Elders Fine Art thirteen, Bonham and Goodman seven, and Shapiro Auctioneers eight since her works first appeared at auction. Her prominence in the primary market has been supported by outstandingly successful solo exhibitions here and overseas that have seen her Grass Seed Dreaming paintings in the 120 x 180 cm. size range selling regularly in good galleries for around $15,000 - $18,000. Her three highest prices at auction have all exceeded $20,000 and were all set since May 2005 when Lawson~Menzies achieved a record price of $21,600 for Wild Bush Grasses 2001 (Lot 36). Since then this result has been equaled and beaten by works offered in November 2005 and May 2007. Her current record stands at $31,200 for a 2003 rendition of Grass Seed Dreaming measuring 240 x 150 cm., which far exceeded its presale estimate of $20,000-22,000. Barbara Weir’s clearance rate is a respectable 62% given her paintings are readily available in the primary market. She is an active enthusiastic painter who is regularly exhibited in good galleries. Her My Mother’s Country paintings are by far the rarest of her works due to the enormous amount of effort that goes in to their creation. The best of these measuring around 120 x 180 cm. sell for up to $50,000 in galleries on those rare occasions when they appear. Gestural Grass Seed Dreamings may currently be judged unfairly against Gloria Petyarre’s Bush Medicine Leaf works but this is unlikely to continue indefinitely. As Weir gains greater recognition and emerges as a major artist and inheritor of Emily’s and Minnie’s mantle, the best of her paintings are set to increase rapidly in value.